In Pirate Captain you must demonstrate your aim with the cannon in a small boat. As a good pirate what you are most interested in is getting money and in this game you will have to collect as many coins as you can. You have an objective score to overcome the level, but all the coins that you get more will be welcome. You have to use your mouse to aim, take power, and shoot the coins to make them yours. You only have one trajectory to try it, if you fail you will have lost one of your lives and you will have to try again the level. If you get it, you will go to the next phase where you will be asked for even more coins to be able to continue advancing. 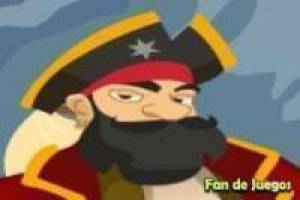 Enjoy the game Pirate Captain, it's free, it's one of our pirates games we've selected.